The first impression of Master Chang, Fu Chen is his fearsome appearance. He is an intense looking man, approximately six feet tall and built like a brick wall. In public, he rarely smiles and wears a set of jade and jewel encrusted rings that make him look like Taiwan’s version of Tony Soprano. Yet, to those people who know him, Master Chang is an astonishing and remarkable combination – martial arts Master, champion athlete and dancer, tea aficionado and a man possessing a wicked sense of humor. Master Chang was born in Tainan, a city in the southern part of the island of Taiwan. At about 7 or 8 years old, he started his martial arts training under the instruction of his grandfather, who taught him southern styles of kung fu. Early in his life, Chang exhibited a passion and talent for sports of all kinds. He pursued this interest in sports during junior high and high school, particularly in the area of track and field. During high school, he was the champion in the 400 meter race; when he broke the existing high school national record in Taiwan, Taiwan newspapers wrote about his athletic ability. After high school, Chang enlisted in the Taiwan national army and became a Tae Kwon Do instructor during his military service. After two years of service, he left the army and, in 1975, started practicing Kung Fu with intensity. Chang found a great number of kung fu schools and he studied at many of them, up to five or six schools at the same time. Such dedication would mark the beginning of his quest for greater Kuoshu knowledge. 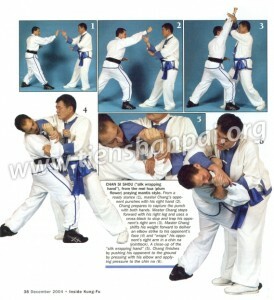 He learned styles such as Lo Han Chuan and Golden Eagle Fist (Jing Ing Chuan) – a Southern style famous in Taiwan. He didn’t care for some of the styles and so he didn’t stay at those schools for very long. Some others styles drew his attention and dedication. In particular, he focused his efforts on learning the various Praying Mantis styles. He sought out as many Praying Mantis styles as possible – Mei Hua (Plum Flower), Seven Star, Mi Men (Secret Gate), Long Fist Praying Mantis (which he says belongs to the Seven Star style), 6 Harmonies, 8 Steps, and so on. He did a comprehensive search for traditional Praying Mantis instructors all throughout Taiwan. Chang continued his dedication to the martial arts by mastering the secret art of martial chi kung. Like his approach to Praying Mantis, he sought out the best teachers in Taiwan for traditional martial chi kung. Ultimately, the best chi kung he saw was San Wai Ju Juan (Three Round, Nine Rotation). The one Master that knew this art was the only chi kung Master that he studied with. Chang noted that the price to learn this method was extraordinary; about 20 years ago, he spent 500,000 Taiwanese dollars for one year of training. Translated in to today’s currency, that would be an investment of nearly $25,000. The results, however, were well worth the expense. Master Chang’s chi kung is legendary. During intermissions at some major tournaments, Chang would stand still and allow people to strike him at will. Their blows had no effect on Chang’s body, even while relaxed, which had been sufficiently conditioned with martial chi kung practice. In 1986, at the 5th World Kuoshu Championships in Taiwan, a member of the Korean national team wanted to test Master Chang’s chi kung. Chang stood in place and let the Korean team member punch him. The Korean, however, went too far and hit Chang twice in a row in an effort to thwart Chang’s chi kung. Chang became angered with the audacity of this competitor and when the Korean went for a third punch, Chang tightened up and exerted the force of his chi kung against the punch. The Korean’s hand bent backwards over his wrist, due to the combination of the force of the strike and Chang’s resistance. While Chang stood unscathed, the Korean had been hurt quite badly. Chang then commented that it was his turn to hit the Korean and see what would happen. Almost immediately, the Korean fighter fled. As a prominent fighter in his division, few people wanted to fight him. They might win the match on the basis of points scored, but would win with substantial injuries that often prevented them from advancing to the next round of competition. During one tournament, his opponent kicked Chang and limped away, his foot injured from the force of the blow against the chi kung conditioned Chang. In some cases, Chang admits, he wouldn’t fight to win. In Taiwan, young students could win scholarships for a university education by becoming a champion at a martial arts tournament. In those instances, Chang would let them beat him in the match so that they could qualify for the scholarships. Chang competed in numerous tournaments at national and world levels, in events such as Lei Tai full contact fighting and demonstrations of single man, two men, and weapon forms. Twice he qualified for the Taiwan national team – in 1986 and 1989 – to the 5th and 6th World Kuoshu Championships, respectively. At the 1986 and 1989 World Kuoshu Championship tournaments, the head coach of the Taiwan national team (Grandmaster Wang, Chueh-Jen) told the other team members to listen to Master Chang’s instructions. Many of the team members started calling him “the Commander” in recognition of his military-like attitude. In 1991, Chang took a U.S. team to Hong Kong for the 4th Asia Cup Kuoshu championship; at that tournament, some Taiwan team members saluted him and still called him “Commander.” Chang would continue to work with and around the Kuoshu tournaments. He served as the Taiwan national team coach to the 1992 World Kuoshu Championship Tournament and he held the position of Lei Tai referee for the 1996 World Kuoshu Championship. Finally, he served as a Tournament Arbitrator or Referee in Chief, Lei Tai for more than ten years at national and international level tournaments sponsored by the United States Chinese Kuoshu Federation (U.S.C.K.F.). In 1986, Master Chang met one of the great old men of Chinese Kuoshu in Tawian: Grandmaster Wang, Chueh-Jen. The term “old man” is used in Chinese martial arts circles as a term of respect for the traditional, strict masters of the past. Master Chang competed as a member of the Taiwan team delegation to the 5th World Kuoshu Championships in 1986, held in Taiwan. Grandmaster Wang served as head coach of the Taiwan team and supervised the preparatory training of all team members. Chang heard that Grandmaster Wang was very good with the double broadsword. Chang demonstrated a double broadsword form and then asked him questions about his performance. Grandmaster Wang remarked that with Chang’s form, the flower was missing its blossom. Through this introduction, Chang began his studies under Grandmaster Wang, starting from the beginning of Wang’s curriculum, which included the style of Tien Shan Pai kung fu. Chang would go to practice every day, brining his Shih-fu various gifts, including tea, food and so on. Chang noted that through this training, he learned the Tien Shan Pai method of free fighting. As experienced as he was with many other styles, he found that Tien Shan Pai’s fighting training to be the most sophisticated and effective method. Four years later, in 1990, Grandmaster Wang died. Before he passed, he told Chang that he has a lot of kung fu brothers and family. He encouraged Chang to contact Huang, Chien-Liang in the United States and to cooperate with him on matters of Kuoshu. Chang and Huang had never met and as typical for a traditional master, many of the students did not know each other. However, before Grandmaster Wang died, he also told Master Huang to find his younger classmate, Master Chang. During Grandmaster Wang’s funeral, Chang saw more than several hundred Tien Shan Pai students lined up to pay their respects to the deceased Grandmaster. Chang didn’t recognize them and he had never seen many of them before that day. As the most junior student, he was the last one to pay respects to his great Shih-fu. Many of the other students, however, knew about Chang, as his skill in chi kung was well known. About six months after Grandmaster Wang died, Chang received a call from his late Shih-fu’s wife. She told him to go to the airport and pick up his older classmate, Huang, Chien-Liang – who was now the reining Grandmaster of the Tien Shan Pai style. At that airport in Taiwan, Chang and Huang met for the first time. In 1991, Chang established links to the United States, through his older classmate, Grandmaster Huang, Chien-Liang and through the students of Grandmaster Richard Lee. Since 1991, Chang has traveled to the U.S. every year. Eventually, Chang knew so many people active in the martial arts community in the U.S. that he felt that he could no longer coach the Taiwanese team in competition against his U.S. friends. In 1995, the Taiwan government sent him to teach in the U.S. for two months. Master Chang traveled to Los Angeles, San Jose, Seattle, Portland, Houston, Columbus, and Cleveland. At each city, he taught at a different school. For many years, he has taught seminars on various Praying Mantis styles at Grandmaster Huang’s schools in Baltimore and also at the annual Kuoshu tournaments in Baltimore. Chang also taught a variety of martial arts seminars at Grandmaster Richard Lee’s school outside of San Francisco. Master Chang helped to build the Praying Mantis curriculum that is part of Grandmaster Lee’s Kuoshu program. In contrast to his ability in martial arts and martial chi kung, Master Chang is a talented dancer. He recalls that one night many years ago, he went to night club in Taiwan. One of his friends, who saw him dancing, remarked about the poor quality of Master Chang’s moves. Master Chang swore that he would become an accomplished dancer and set about learning the various forms of dancing. Soon after Master Chang started training, his dance teacher told him that he should compete in a dance contest, but Chang did not have a partner. His dance teacher found him a partner, and together they practiced for one week. He ended up taking 2nd place in the contest. Master Chang continued his studies, learning from a few other people. Later, he opened his own dancing studio, teaching all forms of dance including tango, waltz, cha cha, rumba, and modern dance. He continues to surprise people who know about his kung fu ability because he can also be so soft and nimble with his dancing. Similar to his interest in martial arts, Master Chang has pursued his interest in Chinese tea from a young age. Like his other activities – kung fu, chi kung, dancing and so on – he decided to invest time and money on tea and teaware in order to better understand the way of tea. He tried many different types of tea from the various famous mountains in Taiwan. He also supplemented his knowledge by visiting the island’s tea farms, learning about the tea harvest, and experiencing tea production first-hand. When he travels, Chang brings a tea set-up with him: canisters of fine Taiwanese oolongs, tea pots and so on. At tournaments and other functions, Chang’s room is transformed into a veritable tea studio, and at all times of day and evening, various masters and students sit around, drink tea, share stories about martial arts and about life. Such is the spirit that infuses the life of Master Chang, Fu Chen. Jonathan Pett Miller is a 65th generation Tien Shan Pai disciple of Grandmaster Huang Chien-Liang. He is a connoisseur of Chinese art, cuisine and tea; collects antique Chinese arms and armor; and is a published author on martial arts subjects.